Just got this message from Bethesda stating that they’re poised to release a premium theme for the Xbox 360 for free to all users who have purchased all 5 of the DLC shapters on Oct 1st. Check it out. Today Bethesda and Microsoft revealed that a premium theme for “Fallout 3” will be released on Xbox LIVE on Oct. 1 free of charge for all players who have purchased all five “Fallout 3” Game Add-ons as of Sept. 22. Gamers who have purchased all five Game Add-ons (English only), including “Operation: Anchorage,” “The Pitt,” “Broken Steel,” “Point Lookout” and “Mothership Zeta”, will receive a token from Microsoft to download the theme for free starting Oct. 1. “This is something we’ve been asked about a lot and we’re happy to finally be able to bring it to fans as a small token of our appreciation,” said Todd Howard, game director and executive producer for Fallout 3. 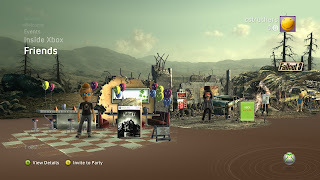 The theme is also available for purchase at 240 Microsoft points.